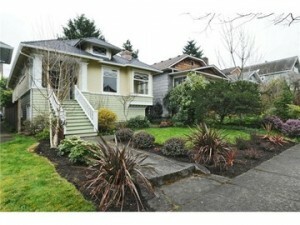 As summer nears, relax on your West facing porch of this sweet-as-pie bungalow with all the Queen Anne charm we expect. Perfectly located a few blks from Big Howe Park/Community Ctr, schools, QA Ave. shopping and eateries. Bright liv rm w/fp, fml din rm, hdwd flrs, open kitch w/breakfast bar as well as eating nook. Kitch opens to fab back deck/gardens (your dog will love you)! Two bdrms incl mstr suite on main, 3rd or rec rm below. Tons more potential currently unfin. Hurry, this won’t last!